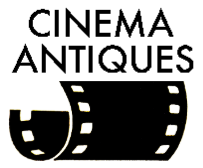 Bill Reiter is the Founder, President and Curator of Cinema Antiques. He has been an active collector of cinema equipment antiques and involved in the motion picture business for over 50 years. He is dedicated to the Rare, Artifact-Sculpture, Authentic, Certified, Collectible, Vintage, Displayable and re-purposed Equipment Antiques of the Hollywood Film Studio and International Motion Picture Industry.